Ms. Boyle-Vellucci also provides counsel to employees with respect to proposed severance agreements and employment contracts, including non-compete agreements. Additionally, she provides guidance regarding, often complicated, requests for reasonable accommodation and family and medical leave. Ms. Boyle-Vellucci is admitted to practice in the states of New York and New Jersey, as well as the United States District Courts in New Jersey and the Southern and Eastern Districts of New York. She earned her J.D. from the Columbus School of Law, Catholic University, where she was a production editor for the Catholic University Law Review. She received her B.A. from Rutgers College, Rutgers, the State University of New Jersey. 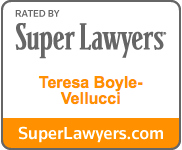 Ms. Boyle-Vellucci has been included in the “Super Lawyers” list published by Thomson Reuters for the years 2009 ("Rising Star") and 2013 to present in the area of Employment and Labor. Please click on the link for a description of the selection methodology for the SuperLawyers list. No aspect of this advertisement has been approved by the Supreme Court of New Jersey. Ms. Boyle-Vellucci is a member of the New Jersey State Bar Association, the Labor and Employment and Women in the Profession Sections, the National Employment Lawyers Association and a former member of the Sidney Reitman Employment Law American Inn of Court. She also is a member of the New Jersey Women Lawyers Association, serving on the Grants and Charitable Giving committee, and provides pro bono services in connection with the New Jersey Pro Bono Partnership program. Ms. Boyle-Vellucci is a court-qualified mediator. She handles both private and court referred mediations with a focus on cases involving employment matters. She welcomes the opportunity to bring parties to resolution in her mediation practice. Her publications include updates to the "Federal Family Leave Act and the New Jersey Family Leave Act" chapter of the Employment Litigation in New Jersey treatise, published by LexisNexis, and “ New Law Assists Families in Their Time of Need, Paid Family Medical Leave Now Available to NJ Employees,” New Jersey Law Journal, July 2008. 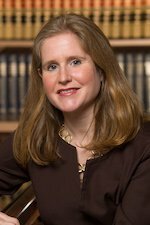 She also has been involved in programs addressing complex employment law issues, including her participation as a speaker on the "MeToo and the Sexual Harassment Crisis" panel at the New Jersey Bar Association's Annual Meeting in may 2018.